Looking for comfort this summer? 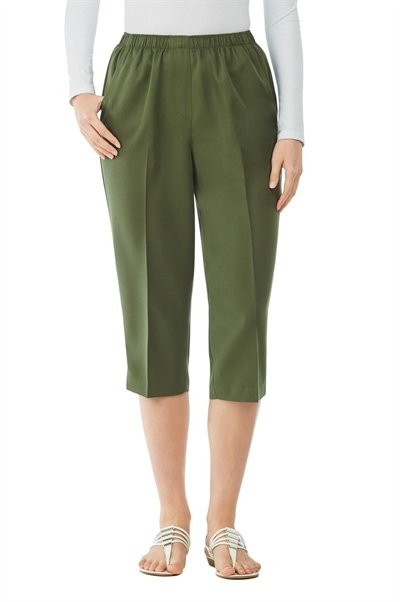 Here's an updated pair of capri pants with flap pockets with snap buttons on the thighs, drawstring ties at the hems, front and back pockets, a fly front and belt loops. These stretch cotton blend canvas pants are made of 69% cotton, 29% polyester and 2% spandex. Peter Nygard 50th Anniversary TBT: Toronto hosts a fashion show featuring both Tan Jay and Alia calling it a "Magical Night of Fashion." 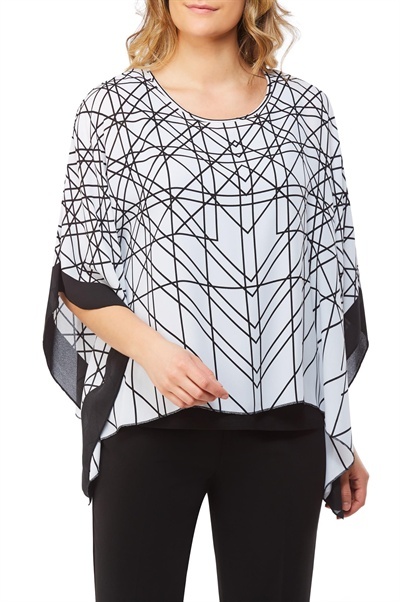 A poncho-inspired top made from chiffon with a geometric print, with a detachable tank top. The plus size is 24 inches long and the outer shell is made of 100% polyester while the insert is made of 94% polyester and 6% spandex. Looking for some color this summer? Here's a smooth, flowy tunic top with a wide crew neck and 3/4 bell sleeves. This T-shirt Microfine jersey is made of 94% polyester and 6% spandex and can be machine washed in cold water. Exposed shoulders are having a moment. 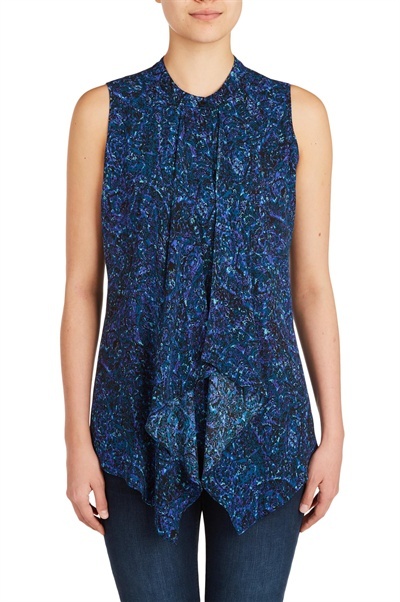 This festival-worthy top embraces the trend and elevates it with ties at the sleeve. The regular size is 28" long and this printed georgette top is made of 100% polyester. 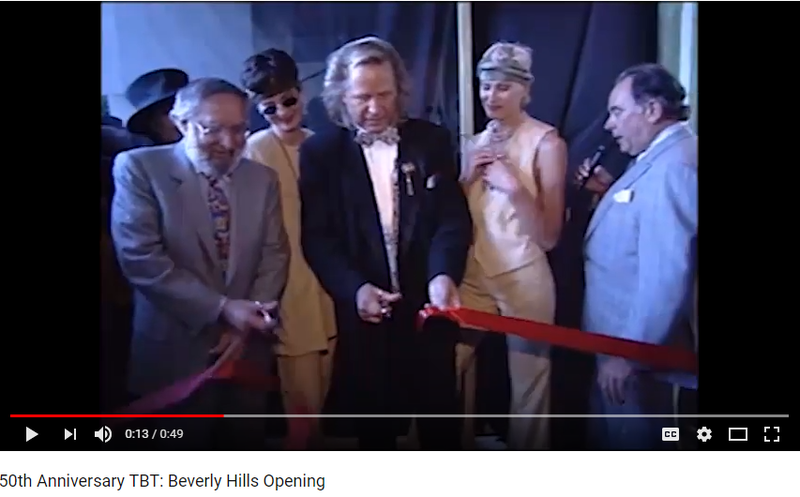 50th Anniversary TBT: TV host Alicia Kay talks about key fashions, staple items and what is referred to as the "Essentials Package" during the Summer 1996 fashion show. 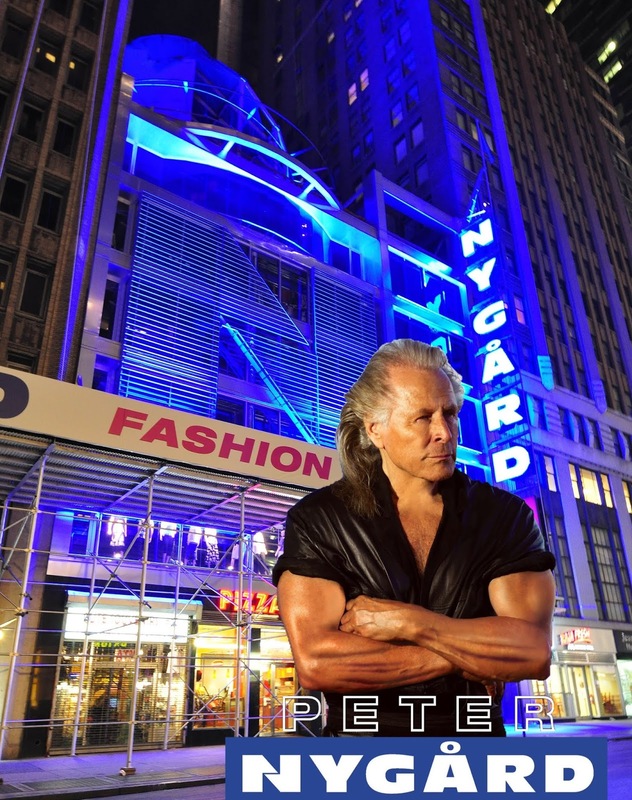 So how did fashion mogul Peter Nygard save his business when faced with threats to his business in the late 80s? Remember, department stores were looking to move away from polyester products, which was Nygard’s core product. Well, the first thing he did was pay attention to his intuition that told him the industry was making some moves that could drastically impact his business. 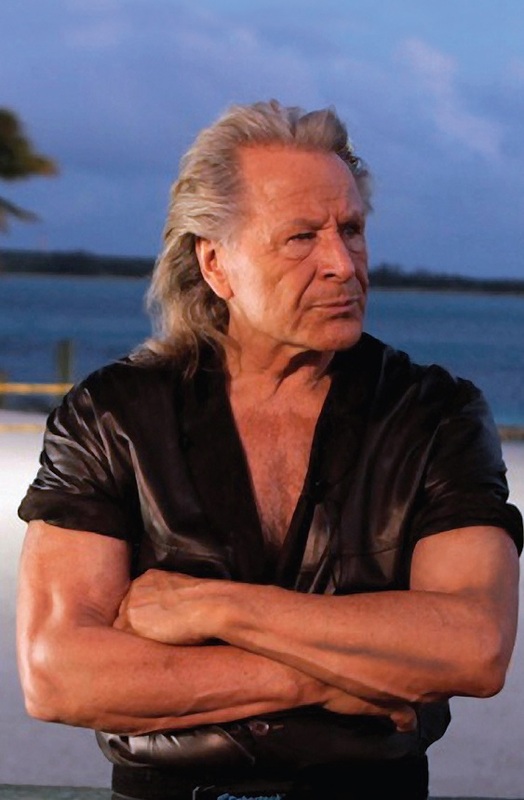 The way Nygard saved his business was to use his intuition, conduct the risk assessment, identify a strategy to mitigate the threats, ensure long-term survivability, and put himself back on top as the industry leader in the new trend. This was Nygard’s approach to every situation because the bottom line for him is to always be on top. Is it any wonder that he took a failing business to a level that reaps rewards of hundreds of millions fifty years later? 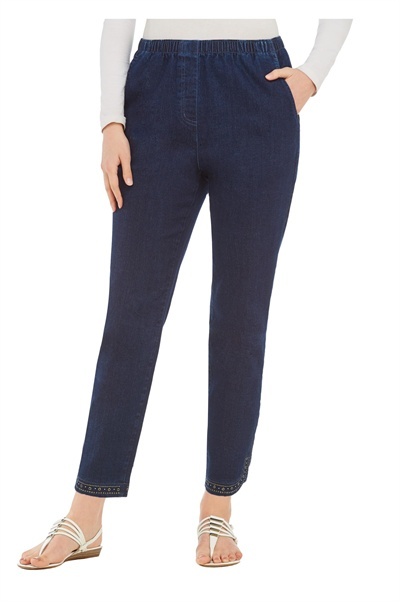 These denim ankle pants have a studded curved hem, front pockets, a pull-on waistband and a faux fly. The regular size has a 27 inch inseam with a 12.5 with a leg opening. 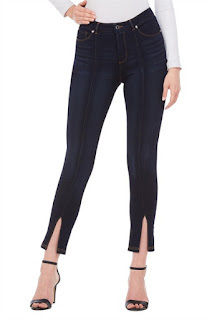 These pull-on Stretch Diamond Denim jeans are made of 79% cotton, 20% polyester and 1% spandex and complete details can be found here. 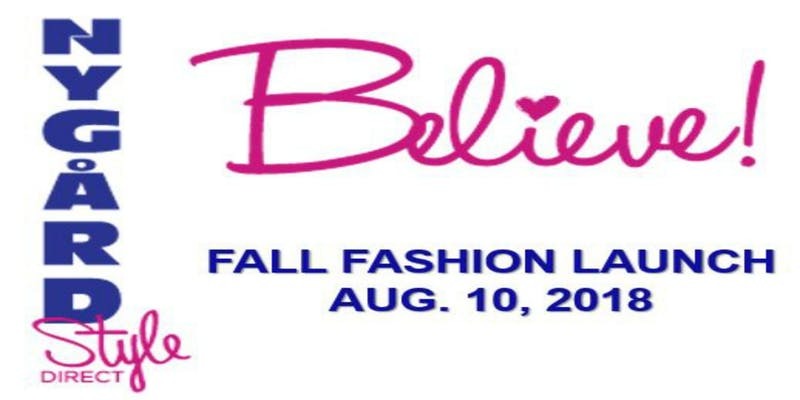 Join us Friday AUG 10 for our Fall 2018 Fashion Show. Stylists along with their guests are welcome to be part of the fashion fun for a $10 admission. Doors open by 7pm, the show starts at 730pm on the 5th Floor with our stylist models celebrating style & fashion for the coming Fall season. 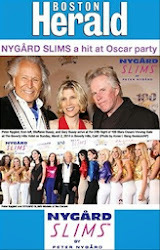 Nygard Style Direct is celebrating our official 2nd year of business. This is just one of many events throughout 2018 as Nygard International celebrates 50 years of success. Independent Stylists across North America have been spreading the word about Nygard, through Style Shows our mission is to help you Fashion your Future -- Real Women in Real Style. Stylists -- Remember to get your tickets for Sat & Sun AUG 11 & 12 for workshop and training too! 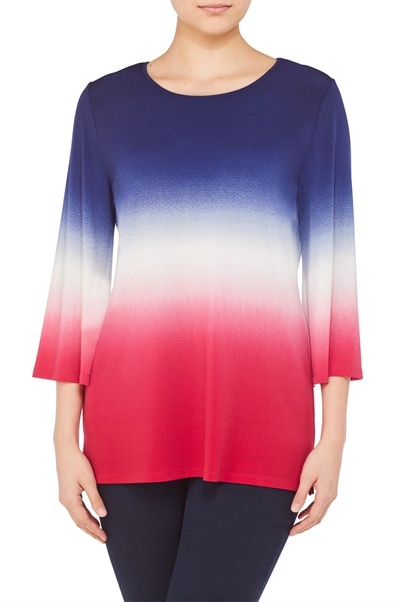 This cool top is the answer to this season's hot weather! 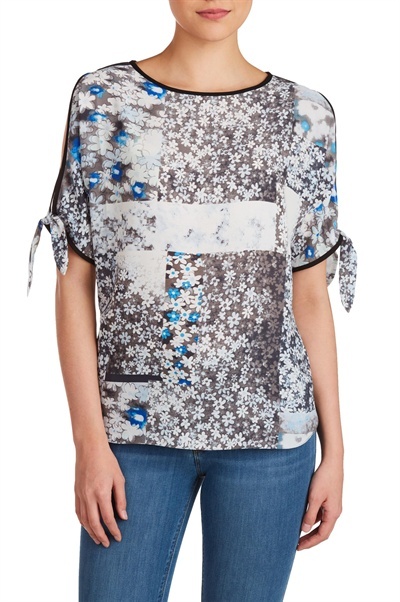 Here's a cold shoulder top with decorative ties at the sleeves and a contrasting trim. The regular size is 25 inches long and microfine blouse is made of 94% polyester and 6% spandex. Where it all began. Peter Nygard bought his first property in 1959 - a cabin in Falcon Lake, Manitoba. 50th Anniversary TBT: A behind the scenes glimpse of our Bianca Nygård photoshoot. Get the look of luxury denim that takes you from day to night with these skinny jeans by Peter Nygård Jeans, featuring seam details with a front slit at the hem and contrast stitching. Our slimmest silhouette from waist to ankle, with 5 pockets, a fly front and a mid rise that hugs your curves and doesn't gape. Exclusive details include the Nygård Wave back yoke, a curved stitching that creates the best shape from back to front, shiny nickel hardware that gives a dressed-up, polished look, functional pockets that are sewn into the front zipper for a perfectly smooth midsection, plus a Peter Nygård signature patch. Our exclusive Luxe denim fabric has 4-way stretch and 24/7 shape retention, for a slimming, contouring fit every time. 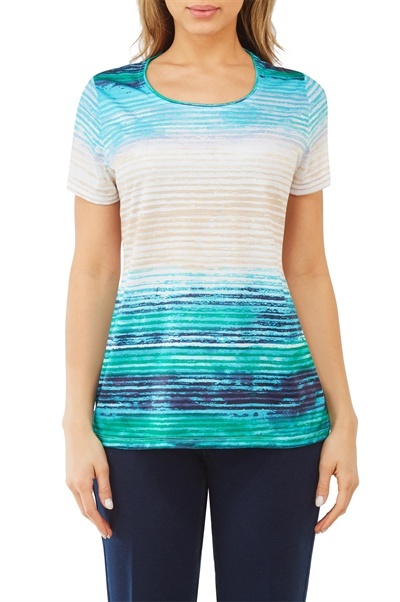 Here's a basic T-shirt is boosted with a brushstroke ombré stripe print. The petite size is 24 inches long and the jersey is made of 100% polyester. Here's a handkerchief skirt with a crescent hem and a geometric medallion print. 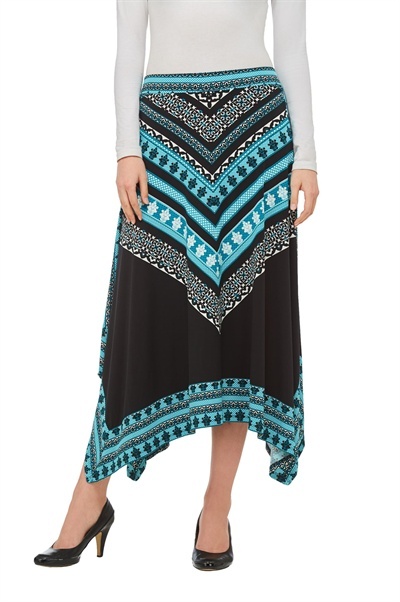 This 32 inch long pull-on midi skirt microfine jersey is made of 94% polyester and 6% spandex and more details can be found here. This sleeveless tunic boasts waterfall ruffles on the front, a button closure at the neckline and a back pleat for added shape. The plus size is 30 inches long and the tunic is made of 100% polyester. We’ve talked a lot about fashion mogul Peter Nygard’s Finnish sisu spirit, and how it makes him persevere no matter the circumstances or difficulties, just like the Finnish soldiers who persevered against the odds and won several battles against Russian soldiers despite being vastly outnumbered; today, as a result, the Finns can say that they have never been subject to Soviet rule. So what does it take to persevere against impossible odds? What made them able to fight to the end no matter what? 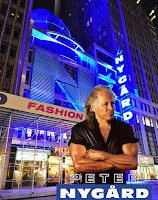 What makes Peter Nygard, like his Finnish compatriots able to always persevere? It begins with the right mindset, which means making a mental shift. That shift involves making a decision, a determination that no matter what, you are going to make it work. But first, give yourself a break. Know that having business challenges does not mean you are not capable of making it work. Even if you have made mistakes in your business, it doesn’t have to stand in the way of your success. Learn from it and move on. 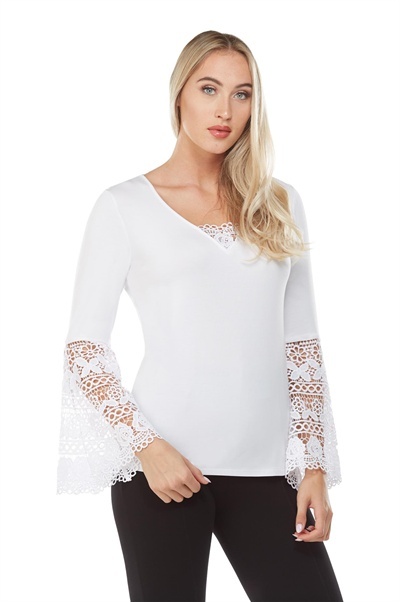 This dramatic top features wide lace bell sleeves, a V-neck with lace detailing and a form-fitting body. The regular size is 25 inches long and this V-neck blouse is made of 95% rayon and 5% spandex. 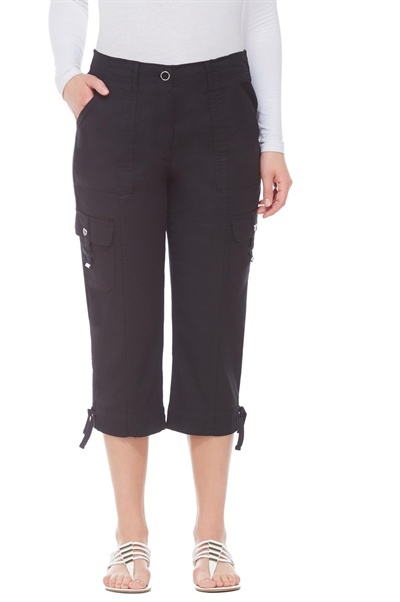 These capris are about to become a wardrobe staple, with a pull-on waist, soft microfiber twill fabric for maximum comfort, and hems with small side slits and a double rivet tab. The petite size has an 18 inch inseam with a 15 in leg opening and they are made of 100% polyester. More information including colour selections can be found here. 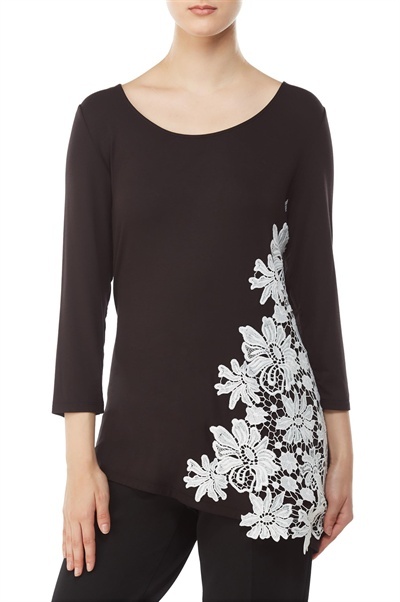 Here's a tunic top with an angled hem, 3/4 sleeves and contrasting floral crochet lace detailing. The regular size is 30.5 inches long and the jersey is made of 95% rayon and 5% spandex. 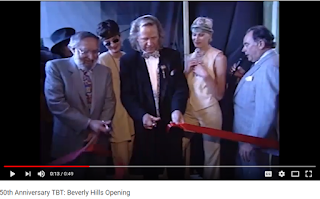 50th Anniversary TBT: Peter Nygård opens a store in Beverly Hills which has always been a dream to do, calling it "a special moment" in his career. No one ever built a $200-million clothing empire on mere flamboyance, hedonism, and a knack for self-promotion, and nobody ever did it alone. And Nygard’s ability to retain top-level executives … is testimony to the caliber of Nygard’s operation and the opportunities he offers. And the company’s impressive growth record—Nygard International has never failed to turn a consistently high profit, and sales have doubled every five years—indicates that Nygard is clearly paying attention to business. Nygard’s route to fashion supremacy may not have been as glamorous as that of his higher-end designer market peers, but in North America, the middle-market is where the numbers are and where the profit lies. What’s more, Nygard’s record has greatly endeared him to his retailers, and will doubtless earn him a privileged reception for his next venture, a signature collection pitted directly against Canada’s “better” manufacturers. Nygard further protects his retailers’ interests (and incidentally, his own) by providing thorough product information and staff indoctrination, plus enviable display and co-op advertising support. 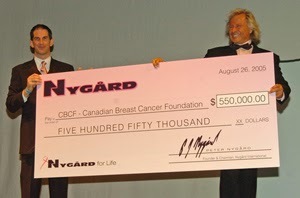 So effective are his tactics that Nygard’s Canadian retail sales amount to $4 per capita, for every man, woman and child in this country—all the more impressive when you consider the company’s low price points—$25 to $150, and the sheer number of units represented. 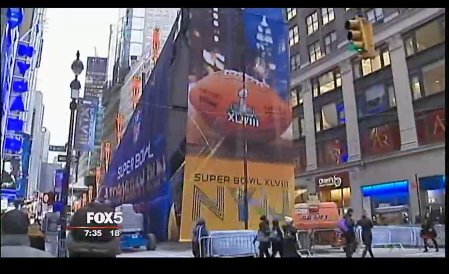 In total, Nygard produces 10 to 12 million garments a year in his Thunder Bay, Winnipeg, Los Angeles, Taiwan, Korea, Hong Kong and Chinese factories.